Hi!! It's been a while since I've shared some of my favorite beauty products. Today I'm sharing with you some of my essential fall products from Ilia! If you haven't heard of Ilia, they you're probably missing out. Ilia is a beauty company that started in Vancouver, Canada. Their ethical products are organic, and made to last. Some of the other organic beauty brands don't have the same quality, and the packaging isn't visually pleasing. 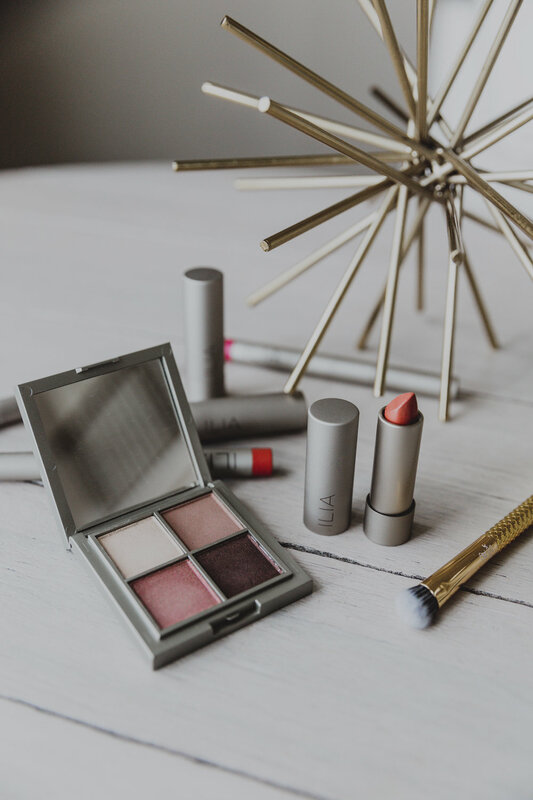 Ilia wanted to stand out within the beauty industry and they have with their recycled aluminum cases, and each product is filled with 85% bioactive organic ingredients. Their clean design is aesthetically pleasing, and they last all day. I've been wearing Ilia for the past two weeks, and I haven't had any complaints. One of the biggest reasons why their a fall favorite is because their lip products are moisturizing and don't leave your lips dry. The colors are also perfect for fall and give a natural glow to your face. For the pictures below I'm wearing the Tinted Lip Conditioner in the color These Days, and I'm also wearing the Prima Eyeshadow Pallet. I can't wait to continue using their products as they are definitely an everyday essential. Make sure to shop my favorite products below!